Hey guys! It is VOTE day! I hope you all exercised your right to vote!! In case you wondered, I have an Au gratin potato recipe already posted. It is a cheesy, cheesy, cheesy recipe. 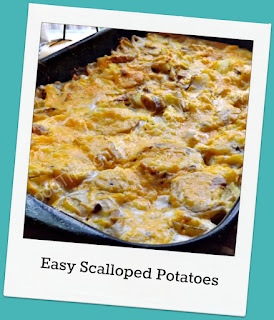 What is the difference between scalloped and Au gratin you ask? Au gratin is with cheese! Scalloped with a cream sauce! I broke the rules and topped this pan of scalloped potatoes with a wee bit of cheese, because I like how it looks better! I hesitate to get into how this recipe can be changed up. I mean, you can use any cream soup you like, I would enjoy cream of celery but my husband doesn't groove on celery, so I use cream of mushroom. You could use cheddar cheese soup and make it Au gratin. You could do cream of chicken and add chunks of chicken for a one pan dish. Remember the recipes I give you are mostly methods, sometimes not, but almost all of my recipes can be changed up and I try to always make sure to tell you if they shouldn't be changed up. Sometimes they are just as they should be, sometimes there is room for adjustments according to taste. This is one of those recipes. Might I suggest always making it the way it is written first, so you know what it was supposed to taste like originally!? We ate these with ham last night, and it was just awesome. This is the second time in 2 weeks I have made this dish because after I came up with the recipe, made it, and loved it, I never photographed it before it was eaten! So I had to make it again, it was just horrible eating this deliciousness twice! I have a little secret to keep this easy and quick in comparison to some recipes. OK, maybe it is no secret, I partially cook my potatoes in the microwave first. Whatever time they would take to become a baked potato, I do half. I prefer the microwave to boiling because I like them to stay dry and not be wet. I made these in a 9x13, but it made a pretty thin layer of potatoes. I like it that way, makes for crispy edges, but you could do them in say a 9x9 pan if you like. That being said, let's get on to the important part, the recipe! Preheat your oven to 350 degrees. Spray or butter the bottom and sides of your pan of choice. Add in sliced potatoes and get them in an even layer,pepper them to taste, then add your seasoned salt. If you use a NO SALT seasoning, remember to add some salt, potatoes are hard to salt enough so make sure you give them a generous sprinkle! Now in a bowl mix together, soup, milk, cornstarch, parm cheese, parsley and salt and pepper to taste. Make sure the cornstarch is dissolved and it is all combined. Pour over the potatoes, top with grated cheddar cheese. Bake for 45-60 minutes. It just depends on how "done" your potatoes were when you started! PS. I left the skins on mine, feel free to peel them first! I love quick and easy, especially as we head towards the holidays. This sounds perfect. Definitely good for the holidays and anytime!! Thanks for stopping by!!! Woooohoooo! I finally figured out how to search your recipes! I know....ridiculous it took me this long but my mobile version was apparently not working correctly. I used to just scroll through FOREVER to get to the ones I was looking for. Now that's dedication! Thanks for all fhe great recpies! !